ince 1995, when the fort was just museum, the fort was asking for volunteers who pollarding willow forests. As captain of the Geuzen Group from Alkmaar, it struck me as a fun activity for my group. After some small talk we organized the first geuzen fortress weekend. We are there when the trees removed for the fort and the fort was visible from the road. This organization gave birth to two sides very well. We agreed in the autumn half fortress weekend to keep the work in which we could finish. The Scouting Museum came later. But on this fort the green work is never “finished”. After the second fortress weekend came the third, and now we have the 28th fortress weekend. The scouts and the fort are now inextricably linked. When a room became available in the fort we soon agreed about something in this area would be located; A scouting exhibition. 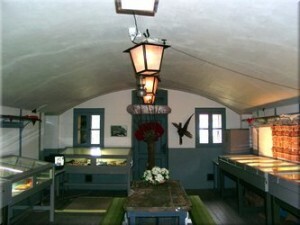 The exhibition at the fort is about 15 years friends between the fort and the scouting. Many photos taken as witness. We also give a picture of how Scouting over the years has grown. From the beginning, 1907 until now. We hope to show a good picture of what scouting was and has become. 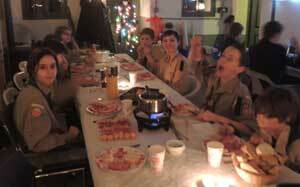 In recent years, the scouting leadership have been organizing a Christmas dinner for the scouts. With Succes!